Description: Eastbound intermodal flys accross the Canyon Diablo Bridge on the BNSF Seligman Sub. Description: Eastbound Q348 with nary a CSX locomotive in sight. Description: Power move to Saginaw yard. Description: A Coal train rolls through Northtown Yard on a sunny Sunday. Description: Not the usual coal train power, but 3 C44-9Ws make up the train. 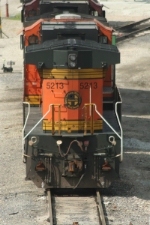 On the rear is a warbonnet. 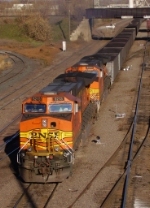 Description: BNSF G-SUPBUR Unit Potash. Description: WOW - A clean Dash 9 - on the BNSF!!! G-SUPBUR departs La Crosse. Description: M-LAWGAL heads for Galesburg. Description: BNSF 9961 & BNSF 5213 lead a loaded ethanol train through the prarie farms of Illinois bound for Saint James, LA.